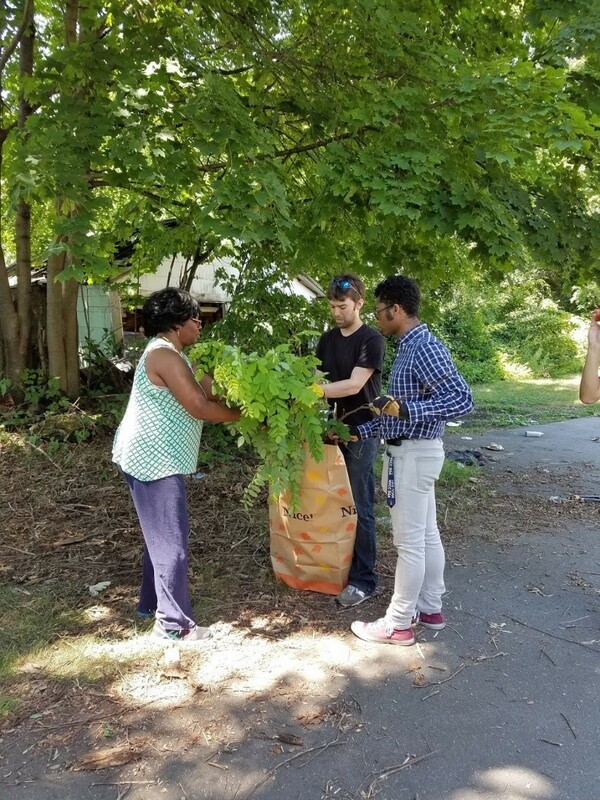 Check out what out Community Building and Organizing Team has been up to this week! This week, Doreen launched free fishing courses at Beaver Pond Park, one of the few public bodies of water designated for fishing in New Haven. The Department of Energy and Environmental Protection stocks the pond with trout and catfish throughout the year. 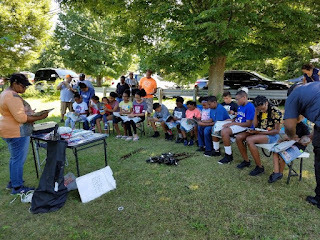 On Wednesday (July 18th), Doreen taught the basics of fishing to a group of 42 students. 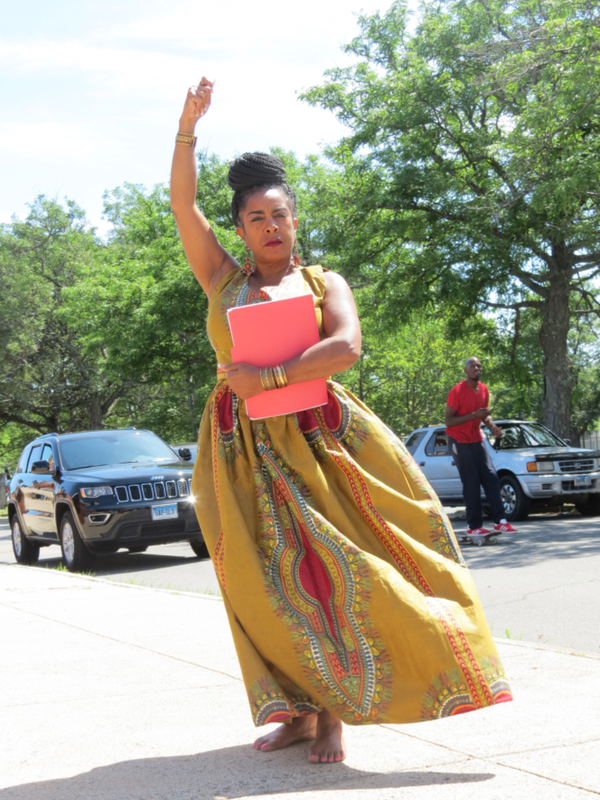 On Saturday (July 21st), she worked with Fixing Fathers, a New Haven organization that works to strengthen father-family bonds, to put on another workshop. 32 people attended the workshop on the 21st and learned how to tie certain knots, how to cast, and different safety precautions to take. The lessons connect residents to a local greenspace and underutilized community fishing site and allow community members to build a coalition invested in the ecology of local waterways. 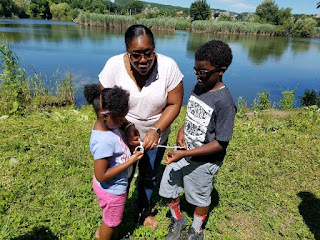 Fishing is a great outdoor activity for the whole family and we have it right here in Newhallville! if you are interested in scheduling a fishing course with Doreen, call her at 203-415-3646. At the Learning Corridor, Doreen and Haley honed their concrete recipe for garden stepping stones. 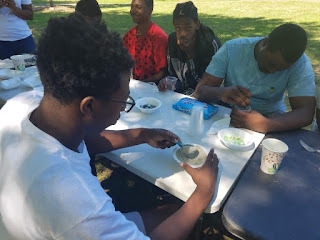 On Friday (July 20th), they guided Newhallville Ambassadors through the process of creating the stones so that the Ambassadors can teach younger students how to make their own. Each student will place their customized stone in the Learning Corridor garden. The stones and beautification activities give the students a sense of ownership that makes recurring visits to the garden more likely. 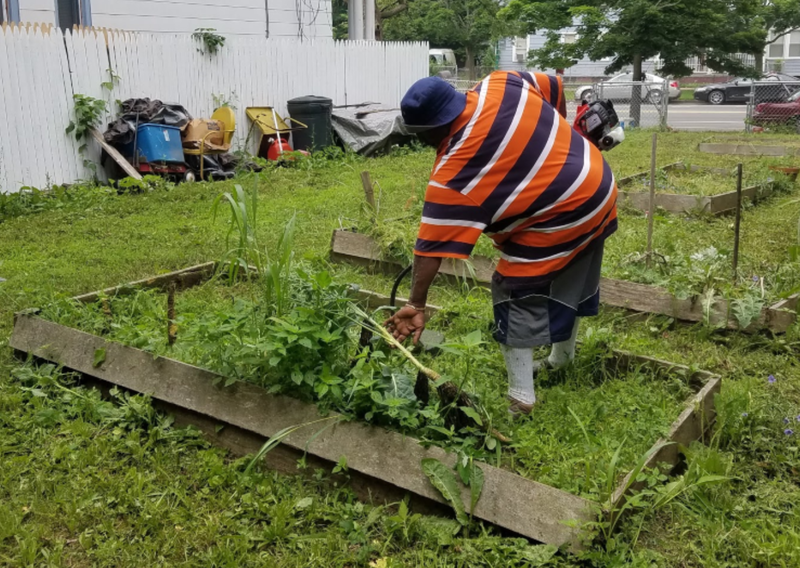 Doreen and Haley also began working closely with Newhallville resident and gardener extraordinaire Mr. Alonzo (pictured below) in the Learning Corridor garden (also known as the Hazel St. garden). At 90 years old, Mr. Alonzo still tends to the community garden almost every day. 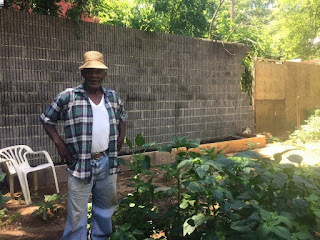 He sowed the bounty flourishing in the garden this season: collard greens, callaloo, kale, tomatoes, corn, squash, and herbs. In partnership with the Learning Corridor, Mr. Alonzo will work as the Learning Corridor Garden Keeper. He will continue to manage the garden and oversee plantings. 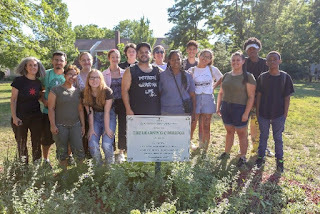 His lifetime of gardening wisdom and knowledge of urban horticulture in New Haven will inform the lessons Doreen and Haley teach to visitors and student groups. Mr. Alonzo already gave Haley tips to ensure the pumpkin patch she planted with students on July 11th will be successful. On Monday (July 23rd), rain prevented Haley and Doreen from hosting an Explore.Discover.Create session at the Learning Corridor so kids were taken to the Harris and Tucker school. Adam coordinated the delivery of a truck-load of wood chips to Sherman Forest on Wednesday (July 18th). The wood chips will be used to cover trails in the forest and protect trees from weeds along the tree corridor that runs parallel to Sherman Parkway. Adam will work with volunteer groups to lay the mulch. Wednesday (July 18th), Adam, Will, and Jared visited resident Kim Martin who lives on Sherman Parkway. The NHS team worked with Kim to bag and clear yard trimmings from her backyard. On Sunday (July 29th), the Mt. Zion Seventh-day Adventist church is sponsoring a road ride with doctors on the Farmington Canal Trail. Residents can stop at the Learning Corridor to ride a bike and talk about healthier living with a doctor from the Mt. Zion Health Ministry. Doreen coordinated the event Kim Holmes-James who works at the Mt. Zion Health Ministries. 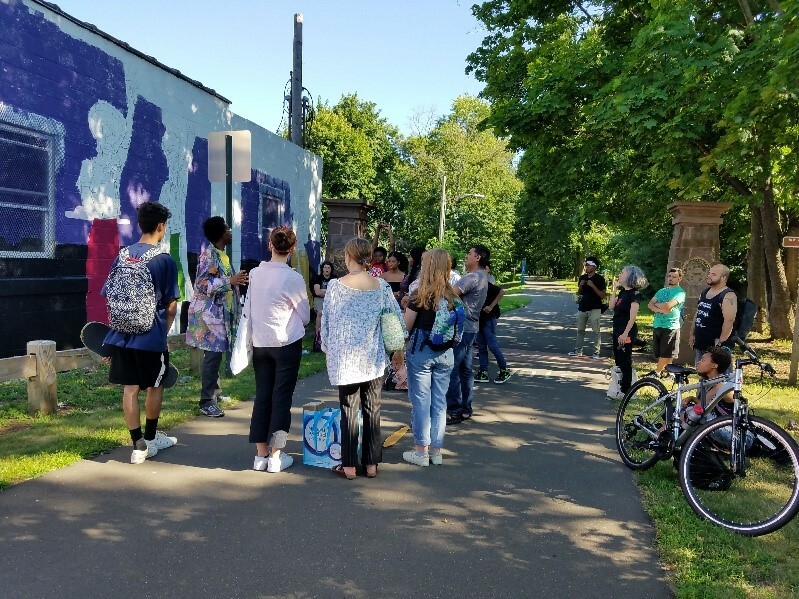 On Wednesday (July 18th), 12 New Haven Public School students who are apprentices at Artspace this summer visited the Women’s Empowerment Mural with their mentor Roberto Lugo. Doreen coordinated the event. The students are working with Roberto to build a large scale ceramics piece that will be showcased at Common Ground Highschool. The group met with Kwadwo Adae, the artist behind the Women’s Empowerment Mural, to discuss the motive for the mural and the role of art in shaping social development. 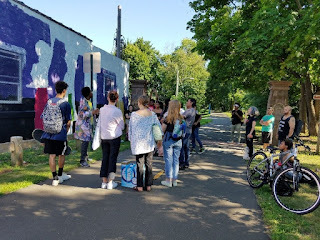 After meeting with Kwadwo, the group walked down the Farmington Canal Trail to the Learning Corridor to discuss hosting a workshop on ceramics for Newhallville residents. The meet-up demonstrated the potential for the mural to inspire future programming and catalyze public art elsewhere in the community. The unveiling ceremony has been postponed until early September when Kwadwo returns from Ecuador where he will be working on another project. In this article, read about how bike advocacy can produce bike equity and how it often fails to do so. 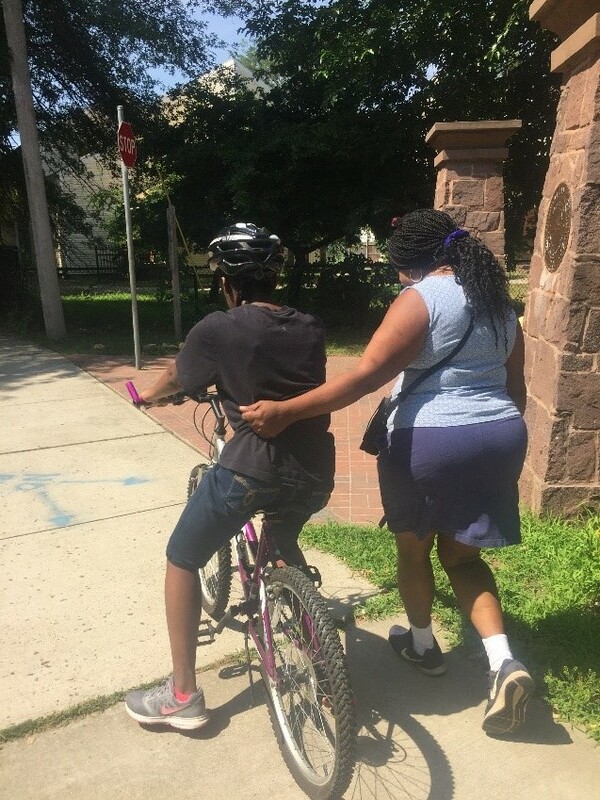 Doreen works to bridge the gap between cycling infrastructure and Newhallville residents. Read about Roberto Lugo’s work to empower communities of color through his ceramic art here. He visited the Women’s Empowerment Mural with a group of students from Artspace on July 18th. On Wednesday (July 11), REI treated volunteers at the mural to free ice cream. NHS provided water and worked with Kwadwo to prepare the mural for the event. 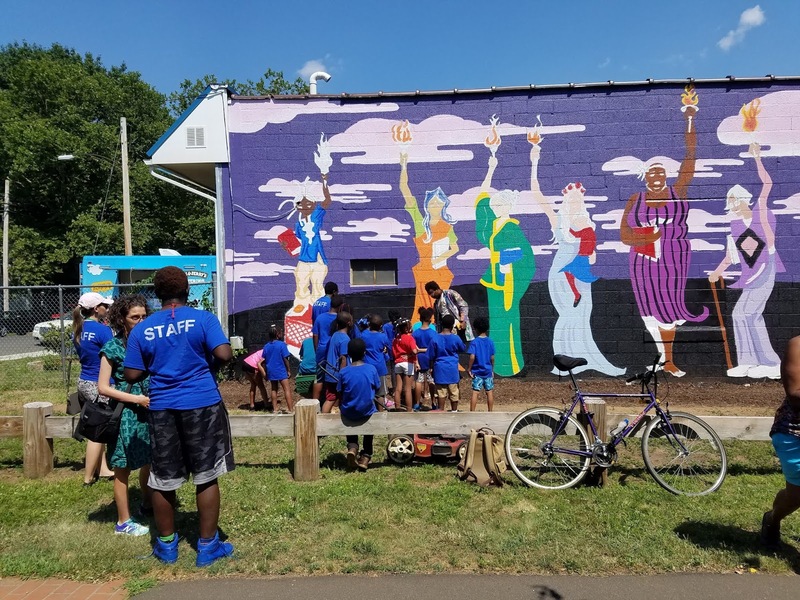 A group of children from the Keefe Community Center in Hamden painted at the wall, ate ice cream, and picked up stickers and temporary tattoos from the NHS. Kwadwo will be at the mural every day from from 5:00 pm to 8:00 pm and on Saturdays 4:00 pm to 8:00 pm. 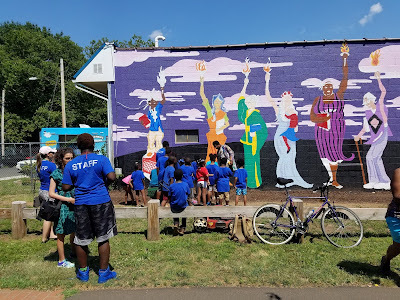 Stop by the mural at 400 Goodrich St on the Farmington Canal trail to help out! The festival attracted over 150 residents and offered attendees free canoe rides, lunch, a magic show, and educational activities about the West River Watershed. The New Haven Fire Department also partially opened a fire hydrant, creating a sprinkler for kids. The festival serves to educate residents about the West River, which runs directly through the West River Memorial Park, and the significance of the West River Watershed. Some families came to the festival from their homes across the street, unware that a river cut through their neighborhood park. 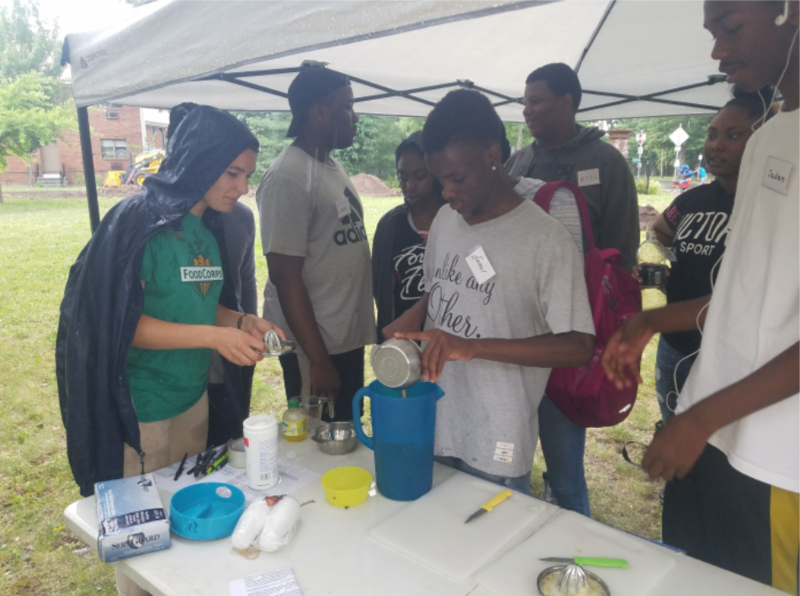 16 organizations hosted interactive activities that dovetailed to explain the ecological importance of the watershed and what residents could do to protect the watershed. At the NHS table, children guided marbles through a rain drop journey to visualize the role of rain gardens in storm water management and pollution control. To the right of the rain drop journey, parents could sign up for free rain barrels with Frank Panzarella from the Bio-Regional Group. Our Summer VISTA Haley painted more than 50 faces at her table. At the West River Watershed Coalition booth, kids tested the pH and oxygen level of water drawn from the portion of the river in the park. Cyril the Sorcerer’s magic routine provoked children to think about how water is polluted and how our waterways can be maintained. The Sawtelles provided live music. There were also tables from New Haven Museum, Connecticut Fund for the Environment - Save the Sound, The Menunkatuck Audobon Society, Science Haven, Quinnipiac River Advocates, The New Haven Health Department, New Haven Bird Club, Regional Water Authority, Connecticut Stands with Standing Rock, and the CT Department of Energy and Environmental Protection. 14 volunteers from Bike and Build pulled knotweed, collected trash, and cleared trails at Sherman Forest on Tuesday (July 10). They also cleared a new trail head that faces Sherman Avenue and connects to the existing trail in order to make the trail more visible and accessible. On Monday (July 16), volunteers from the Choate Summer Volunteer Corps collected trash at Sherman Forest before coming to NHS for a presentation by Adam and Kathy explaining the importance of removing trash from the West River Watershed. At the Learning Corridor, Doreen and Haley continued to work on the gardening beds and the urban oasis. Newhallville Ambassadors came to the site three times. On Wednesday (July 11), the ambassadors worked on beautifying the space and planting a new pumpkin patch. On Friday (July 13), they performed greenspace maintenance. New Haven cycling advocate Paul Hammer taught a lesson on bicycle safety. After the lesson, the ambassadors rode down the Farmington Canal Trail with bikes from the Learning Corridor. 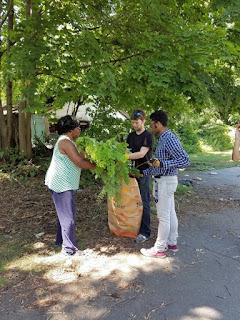 On Monday (July 16), children from the Harris and Tucker school and the Newhallville neighborhood laid mulch with the ambassadors. After gardening maintenance, Haley and the ambassadors played active games with the children. 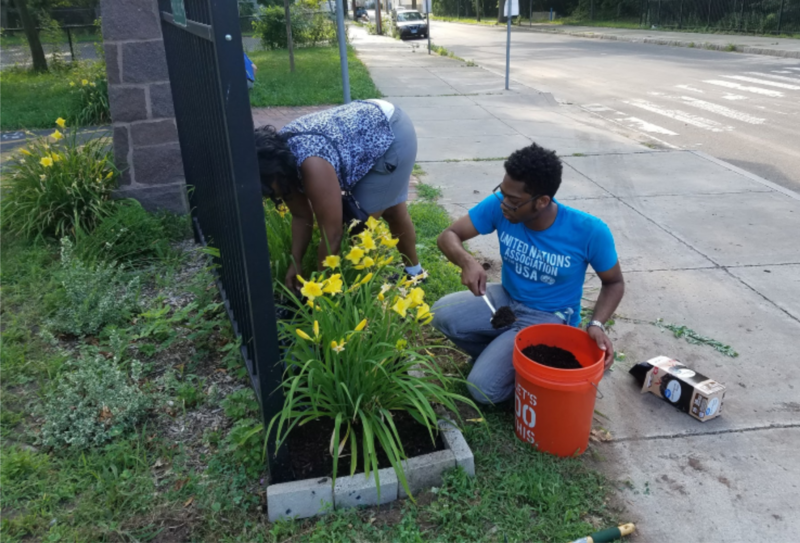 Haley has contacted over 94 New Haven residents about their interest and expertise in gardening and she is following up on the initial survey.Contact here by following this link. In Women’sEmpowerment Served A La Mode, Lucy Gellman covers the Wednesday (July 11) volunteering event at the Women’s Empowerment Mural. 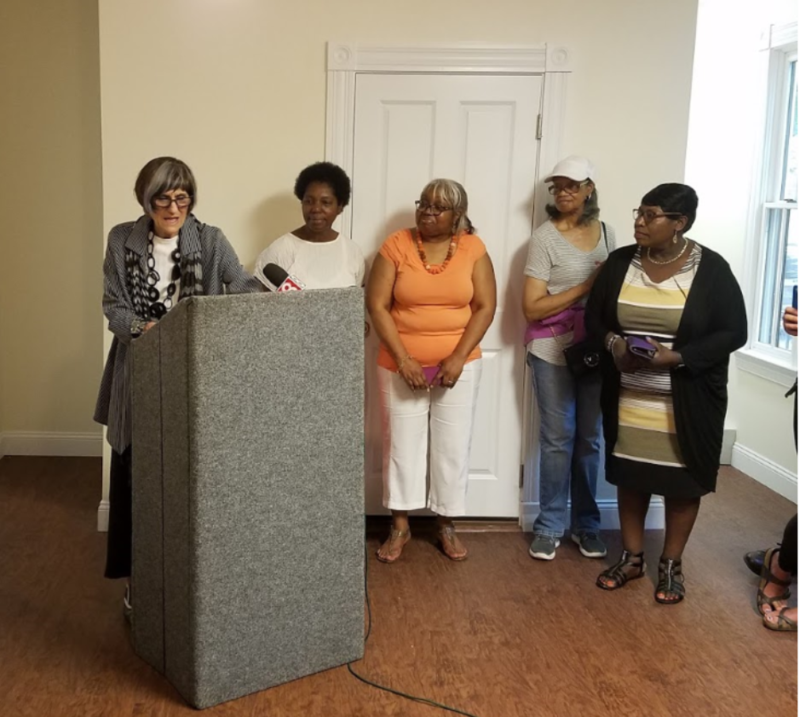 Read about the challenge to define affordable housing in New Haven and how the Affordable Housing Task force is reckoning with it in this article in the New Haven Independent. YES! Magazine explored the challenge of providing affordable housing to all Americans in their most recent issue. It covers co-ops, community land trusts, multi-generational homes, and indigenous home design principles. Read the entire edition online here. Kwadwo Adae is adding a new edition to his design for the Farmington Canal Women's Empowerment Mural that is currently in progress! He is modeling one of the women on the wall after Diane Brown (left) the Stetson Library Branch Manager. In 2017, Diane received the Connecticut Library Association Special Achievement award, in recognition for her work to build programming that engages residents at the Stetson Library (link). 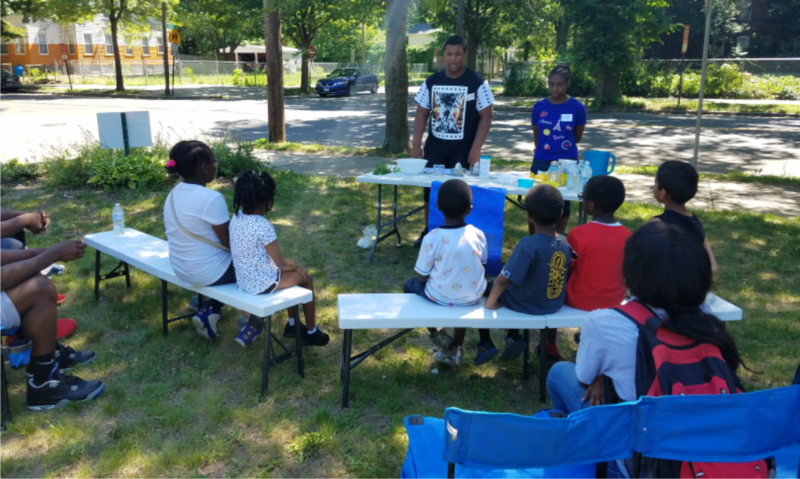 She forged partnerships with other community organizations to offer the "Teach Them While They Are Young," series of youth programming. The Women's Empowerment Mural features other accomplished women like Diane to call attention to the invaluable and often unacknowledged work of women in the greater New Haven are and in the world. Contact our Americorps VISTA Haley Brown at this link to get more information or to volunteer for the project! 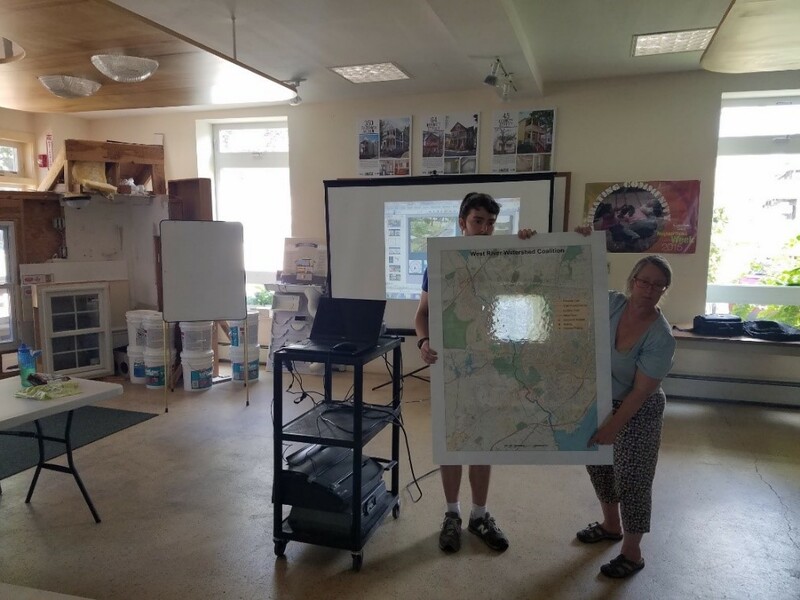 At the Learning Corridor, Doreen and Haley coordinated with Bradley from the New Haven Land Trust to bring soil to the Hazel St garden for a pumpkin patch. Doreen also coordinated with Katie, a nutritionist from the American FoodCorps, to teach a group of Newhallville Ambassadors how to make fresh mint lemonade and incorporate home-grown ingredients into meals. The Newhallville Ambassadors are employed through the Newhallville Safe Neighborhoods Initiative developed by Arthur Edwards. Ambassadors strengthen their commitment to Newhallville and build skills to be agents of change through local community service. On Monday (July 9th 2018) the ambassadors shared what they had learned with a group of children from Harris and Tucker School. The exchange will serve as a model for future Learning Corridor programming that will teach residents community stewardship and enable them to share their knowledge with their neighbors! Doreen and her assistant Jonathan De Los Santos, a representative from the United Nations' Student's Association (pictured to the right) worked on the continuing Learning Corridor Beautification Project both Tuesday and Thursday nights from 5 - 7pm. This week they were laying mulch in flower beds along with general landscaping. Contact Doreen by following this link to get involved and keep the corridor looking beautiful every week! 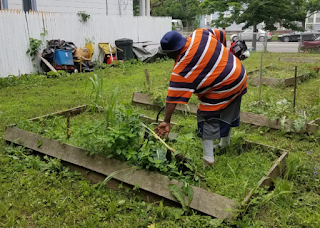 Will and Stephen visited Mr. Brown (pictured right) at the Dixwell Community Garden to help cut back overgrowth and prepare the garden for cultivation this summer. 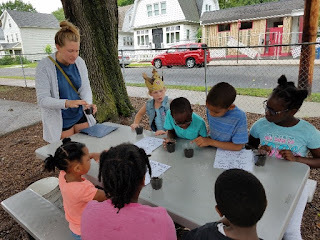 Haley sent out her initial questionnaire to gauge community interest in gardening and identify key assets in the community gardening landscape. She is currently developing a skill-share program between experienced gardeners and residents who have a budding interest in gardening. She wants to make gardening acceSsible to everyone and capitalize on the wisdom of New Haven's great gardeners. Follow this link to participate in her survey! Rosa DeLauro, the representative for Connecticut's third congressional district, visited a Neighborhood Housing Service's home that has recently been rehabilitated for a press conference on the impact of Trump's tax bill on Connecticut Homeowners. Bridgette Russell, the Director of our Home Ownership Center, started by describing our mission to build communities by cultivating home-ownership as well as the negative impact the Trump tax bill could have for the homeowners we seek to empower, before introducing ward 20 Alderwoman Delphine Clyburn. Delphine gave some heartfelt words on her experiences in her ward before turning the mic over to DeLauro for the rest of the event. DeLauro presented the results of a staff report linked here prepared at her request. According to the report, the Tax Cuts and Jobs Act (Trump's tax bill) will significantly increase the tax burden on Connecticut homeowners while handing a windfall to wealthy developers. This bill prevents homeowners from deducting more than $10,000 of their property tax from their income tax. Additionally homeowners will not be able to deduct interest payments on home equity loans from their taxes unless the loan is being used for home improvement. The bill also ends a tax deduction for mortgage insurance premiums from those with incomes below $100,000. The wealthiest will not bare an equal burden. In just the next year, real estate developers will benefit from a $3.7 billion cheaper tax cut. This new increase on top of New Haven's recent 11% tax hike (which you can read more about here) could easily spell disaster for many of our neighbors. DeLauro echoed this sentiment saying that the Tax Cuts and Jobs Act undercuts the financial security a home provides, damaging a core component of the American Dream.